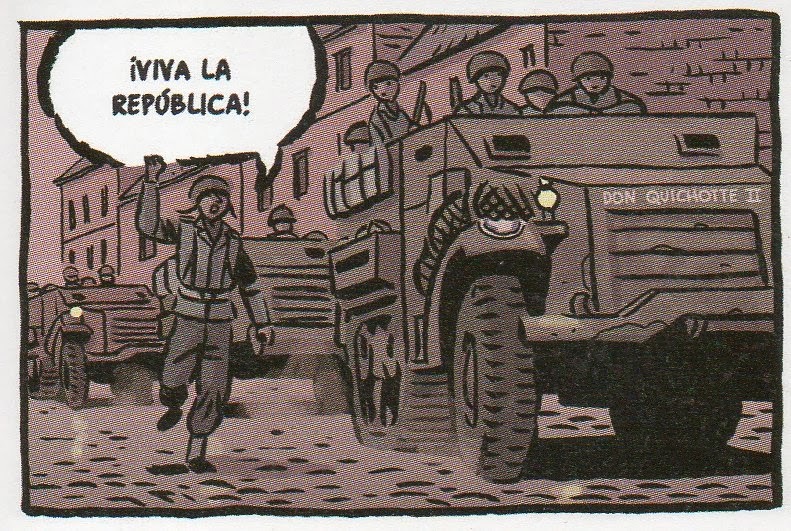 Graphic novelist Paco Roca worked with ALBA’s Bob Coale to chronicle the odyssey of “La Nueve,” the company of Spanish Republicans who fought the Nazis with General LeClerc. Postwar France was built on the proud notion that the whole country had bravely resisted the German occupation. As late as the 1960s, Tony Judt wrote, “any questioning of the myth of a heroic, nationwide resistance was still off limits—in historiography as in national life.” What this myth obscured was not only the extent of French collaboration with the Nazis; it also erased the key role played in the resistance and liberation by non-French volunteers—particularly Spaniards. Thousands of the half million Spanish Republicans who had poured across the Pyrenees in 1938 and 1939 continued their fight against fascism in anti-Nazi guerrilla groups (the maquis) and in General Charles De Gaulle’s Free French Forces. After their liberation from concentration camps in North Africa, hundreds joined the newly created Leclerc Division, in the well-founded belief—and implicit promise—that a defeat of Nazi Germany would lead to a defeat of Franco. It was a promise that the political situation in 1945, with the incipient cold war, did not allow to be fulfilled. 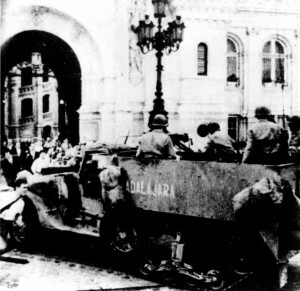 The half-track “Guadalajara” in Paris, August ’44. The company of LeClerc’s armored infantry with the largest contingent of Spanish was the Ninth. Even non-Spanish-speakers, referred to it as “la Nueve” not the French “la Nuevième.” The half-tracks of this company—guided by an Armenian volunteer on a motorbike—were the first to enter occupied Paris on August 24, 1944. The Spaniards had named their vehicles for the battlefields in which the Republic had beaten the Nationalists during the Spanish Civil War. Most of these Spanish soldiers had survived a grueling odyssey. After three years of civil war, they had passed through French concentration camps, fought a long North African campaign, and spent a training period in England. They had disembarked on Utah beach in Normandy in early August and fought their way to the capital. It’s a riveting story that is nevertheless still largely unknown to the public. It’s unknown in France, for the reasons just outlined. But it’s equally unknown in Spain, which until recently preferred not to see its history in relation to World War II. Paco Roca’s Los surcos del azar (The Furrows of Chance), which came out to critical acclaim in Spain in 2013, now tells this story for the first time as a 300-page graphic novel. 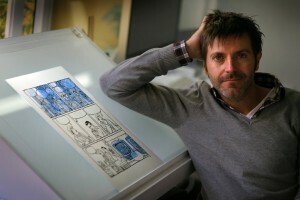 Roca, who was born in Valencia in 1969, is one of Spain’s foremost graphic artists; his 2007 novel Arrugas (Wrinkles) won the National Comics Award. Los Surcos took him four years to write. Set in present-day France, it features a Spanish writer named Paco who tracks down Miguel Campos, aka Miguel Ruiz, a surviving veteran of “La Nueve.” After some coaxing, Miguel tells Paco his story through long flashbacks. 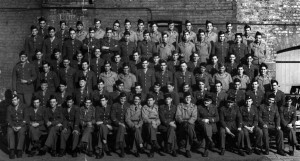 Miguel’s character is based on one of the most famous members of the company, who disappeared in combat in December 1944. Some claim he was killed, and others that he deserted the French army to participate in the underground against Franco. 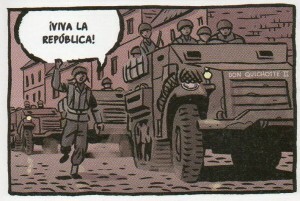 “La Nueve” in England, spring 1944. What sets Surcos apart is not just Roca’s superior drawing and storytelling, his eye for detail and anecdote, and his graphic ingenuity (with the present-day frame drawn in gray tones and the flashbacks in color), but also the high level of historical accuracy. Here Roca acknowledges the crucial assistance of the Paris-based historian Robert S. Coale, who is a long-time ALBA board member. Bob Coale’s own book on one of the members of “La Nueve,” which he has spent over a decade writing, is scheduled to be published next year. The excerpt published below is from one of the novel’s last sections, starting with the last-minute decision to enter Paris rather than continuing east. We also meet Larry Cane, a veteran of the Lincoln Brigade who, as a member of the U.S. armed forces, had landed in France on D-Day and was thrilled to run into his former Spaniards comrades. The Spanish-language edition of Los surcos del azar, published by Astiberri Ediciones, can be ordered here. I suggest to read also Evelyn Mesquida’s “La Nueve”, a novel which started the interest of Paco Roca in these brave spaniards. Great comic. My father, Manuel Munoz landed on Omaha Beach Dec7. fought at St Loo and marched into Paris as an American soldier. Every Spaniard in my family fought in WWII. All sons of Spanish immigrants from Spain to Hawaii to California. My uncle Jerry Yglesia fought at Bastogne. Thank you for doing this piece, Sebastiaan! I had the chance to read this book this week and will be reviewing it shortly on my blog. In short, phenomenal work by Paco Roca. I will be reading the novel Enrique suggests as well. This is an inspiring and sadly forgotten story.